Hi everyone, I hope you all had a great weekend.. Did you do anything exciting? You might not know this but I have been attending quilting class for around 15 years and yesterday (Sunday) we had our yearly all day workshop at Treehouse Textiles in Merrick, Victoria, we were surrounded by beautiful bushland overlooking a lake, we had lunch on the deck outside watching the ducks swimming around, such bliss but goes way too fast, this was out 2nd year we have been there so looking forward to the next one. So back to this lovely 10th Anniversary card I made for a friend. I used Thick Whisper white card stock for the base of my card and cut out the heart with regular Whisper White card stock using the Bloomin die set and using the same die set cutting out the cute little flowers with Dapper Denim card stock. 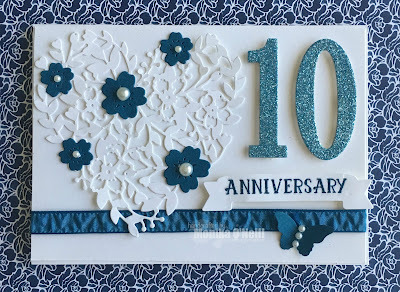 The 10 was cut out from blue glitter paper I happen to have in my stash and the Anniversary sentiment is from the Number of Years Stamp & Die set Bundle, for the butterfly I used my Bitty Butterfly punch using Dapper Denim card stock, the embellishments I used are Pearl Basic Jewels and Dapper Denim Ruched Ribbon. I hope you like todays card, let me know what you think. If you are interested in learning how to make this card or any other paper crafts contact me, I will post class time table today for August. Click on any of the products you need below and it will take you to my shop.